Johan Krijgsman, José Peeters, Geeke Waverijn, Britt van Lettow, Lucas van der Hoek, Judith de Jong, Roland Friele, Lies van Gennip. 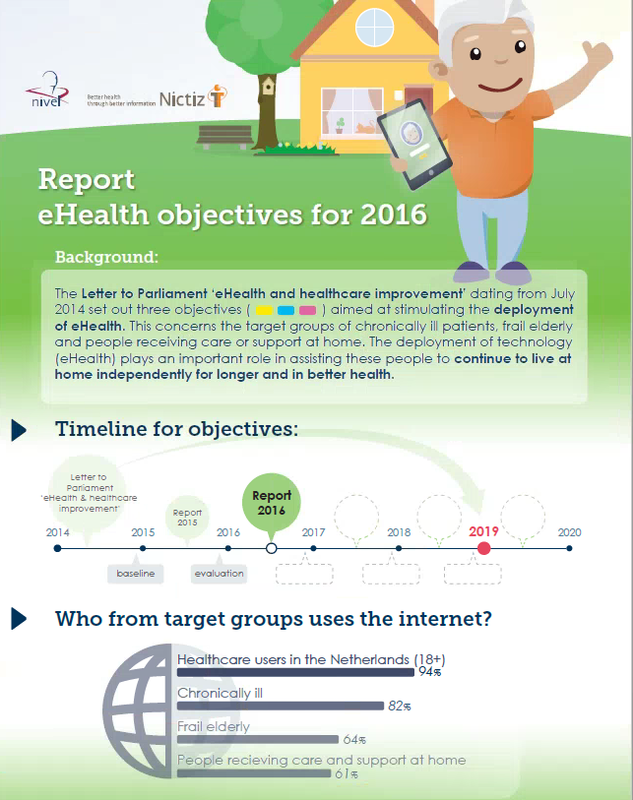 This infographic belongs to the evaluation report on eHealth objectives for 2016.The evaluation of objectives by the Ministry of Health, Welfare and Sport (VWS) forms a special edition of the eHealth monitor, a study by Nictiz and the NIVEL Institute that charts the availability and use of eHealth in the Netherlands every year. The next (main) edition of the eHealth monitor is expected in october. That edition will look not only at the use of eHealth among healthcare users in general (Dutch people aged 18 and above) but also at the use of eHealth by healthcare providers (including doctors and nurses) and the possibilities made available by healthcare providers to their patients. This report on objectives focuses only on those applications mentioned in the ministerial objectives and examines three special groups of healthcare users, being chronically ill patients, frail elderly, and people receiving care and support at home.